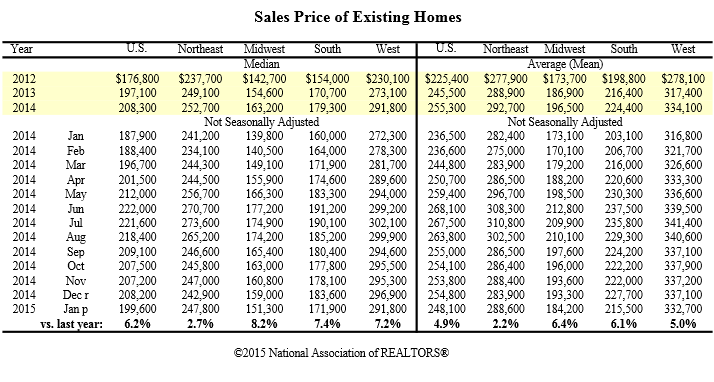 According to the National Association of Realtors® (NAR), sales of existing homes dropped in January to the lowest rate in nine months, however this level was higher than a year ago for a fourth month in a row. While the Northeast and West witnessed the largest declines, all major U.S. regions had drops in the first month of 2015. Total existing-home sales in January (reflecting transactions for single-family homes, townhomes, condominiums and co-ops) dropped 4.9 percent to a seasonally adjusted annual level of 4.82 million (the least since April, 2014 with 4.75 million) from an upwardly-revised 5.07 million in December. Notwithstanding January’s decline, sales ran 3.2 percent above what the market experienced one year ago. NAR’s top economist, Lawrence Yun, noted that the housing market saw a somewhat disappointing start to 2015 with January closings down across the nation. According to Yun, “January housing data can be volatile because of seasonal influences, but low housing supply and the ongoing rise in home prices above the pace of inflation appeared to slow sales despite interest rates remaining near historic lows.” Yun also said “Realtors® are reporting that low rates are attracting potential buyers, but the lack of new and affordable listings is leading some to delay decisions.” Total U.S. housing inventory of existing homes for sale at the end of January grew 0.5 percent to 1.87 million. This is 0.5 percent below 2014 levels (1.88 million). January’s median existing-home price for all housing types was $199,600, representing a 6.2 percent gain over January 2014. This is the 35th consecutive month of year- over-year price growth. How long did properties stay on the market in January? Homes remained on the market a bit longer in January (69 days) than December (66 days) and one year ago (67 days). Short sales were on the market the longest at a median of 128 days, while foreclosures closed in 63 days; non-distressed properties took 68 days. Thirty percent of January’s home sale were on the market for less than a month. Your credit score is a composite snapshot of your credit history. A high credit score takes time to cultivate, and is not likely to raise much in a short period of time. Generally speaking, you want to make sure you pay your bills on time, keep outstanding debt levels to a reasonable amount for each account, and avoid closing accounts you’ve successfully paid-off and managed. Don’t lose hope if you have less than perfect credit, there are still good loan programs out there for responsible borrowers. We have a list of preferred local lenders who can help you find the best financing programs for your specific needs. Contact us and take advantage of today’s low interest rates! Copyright © 2003-2015 Real Pro Systems LLC. All rights reserved.